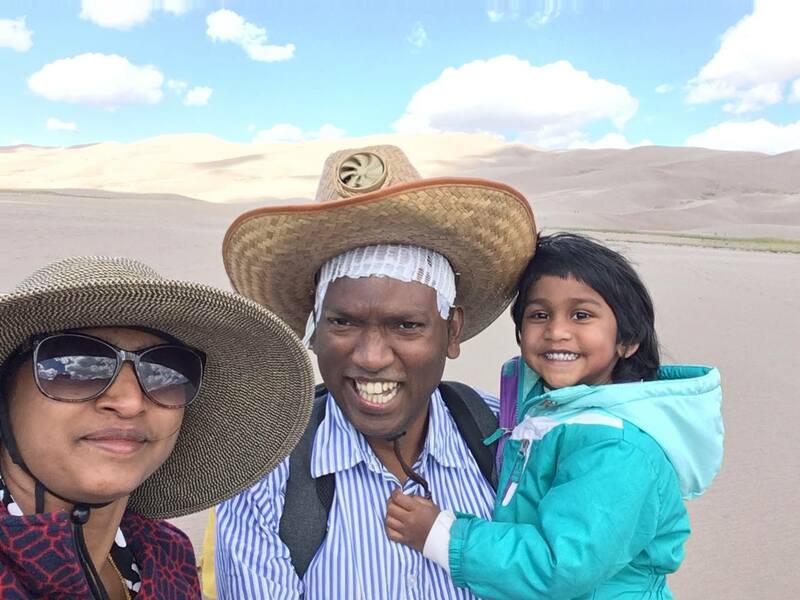 My journey with Glioblastoma - Prakash Murthy: I like being alive. So I will wear Optune always forever. I like being alive. So I will wear Optune always forever. So the Standard Of Care (SOC) treatment conventional medicine offers for Glioblastoma patients consists of chemotherapy & radiation therapy over 6 weeks, followed by 6 or more cycles of higher dosage chemotherapy treatments. All of this is likely to be completed 6-9 months after the initial surgery. That is it. Nothing more. 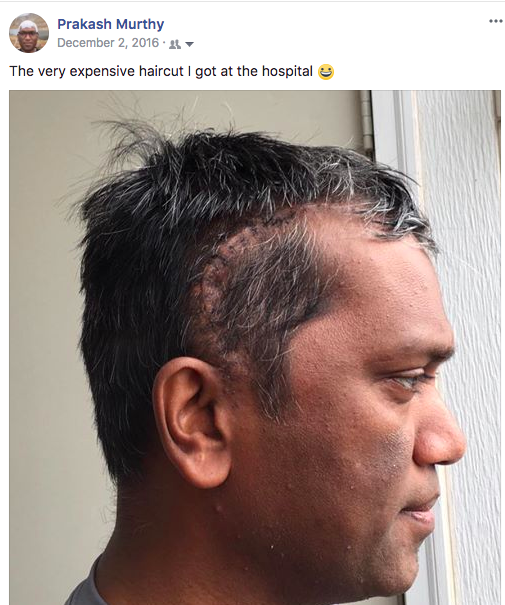 The reasoning behind this treatment plan seems to be to get the patient to live a relatively healthy life till the tumor comes back in about a year/18 months - as is the expectation, and the patient can undergo another de-bulking surgery (Craniotomy) to survive for a few more months. 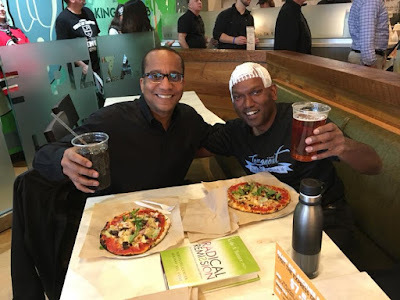 My conclusion from having gone through the complete SOC treatment for Glioblastoma is that the medical community operates with the assumption that the patient will die sooner or later. Not much hope of long-term survival from that corner. If I depend only on SOC treatment for GBM, the path I am likely to take will involve a few more craniotomies over the next few years, till my body can't take it anymore and gives up, ending my life. In the barren wasteland that is the GBM treatment landscape, I see Optune as a sole ray of hope. It does not cure Glioblastoma, but helps survive it by preventing the tumor from recurring. At least for some time. Maybe for ever. I am lucky to be given Optune as one of the options. The medical community (including my Oncologist) is not very convinced of its long-term effectiveness. 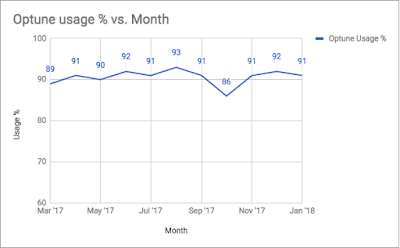 My Oncologist recommended discontinuing Optune after 6 months of usage as he says there is no study to support its continued effectiveness beyond 6 months. I overruled him saying I am convinced of its effectiveness and want to be on Optune forever. I was very convinced of the benefits of Optune right off the bat when I first heard of it during the initial research into GBM and its treatment. The theory - the device generating alternating electric fields interrupting cell division process to prevent the tumor from growing - seems like stuff straight out of science fiction, but is very real and is very compelling to me. Especially since there is nothing else to offer even a sliver of hope. The recommended usage time is for the patient to have Optune on a minimum of 75% of the time. That is, 18 hours in a 24 hour day - so even when the patient is sleeping. 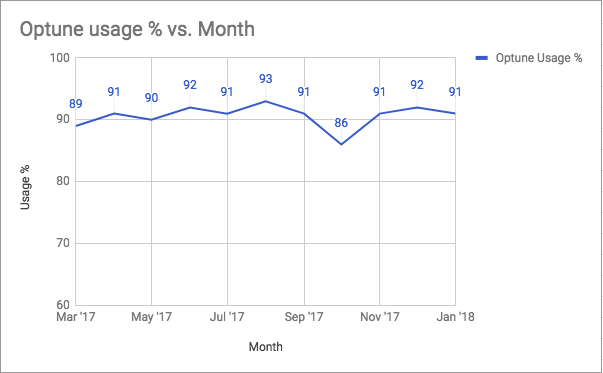 Since I started on Optune towards the end of Feb 2017, I have been averaging very high on monthly usage percentage for Optune - over 85% always, and above 90% most of the time. THE MORE TIME I HAVE OPTUNE ON, THE LESS TIME THE TUMOR GETS TO GROW BACK. SO THE MORE TIME I HAVE OPTUNE ON, THE BETTER MY CHANCES OF LONG-TERM SURVIVAL! 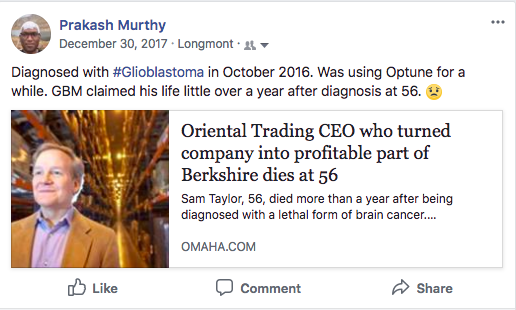 Towards the end of 2017, my confidence in the efficacy of Optune was shaken a bit on reading about the death of Sam Taylor, who was among the first users of Optune. 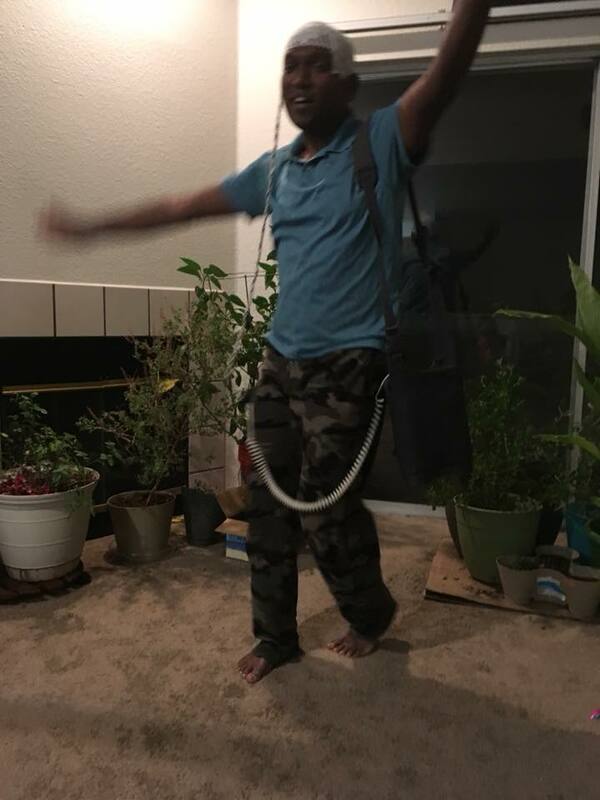 I built back my confidence in Optune, and about my ability to survive GBM by considering the fact that Sam is not likely to have the high utilization rate that I was maintaining through out, and there may be other factors that could have contributed to his death. The folks at Novocure have given a lot of thought on how to make it as easy & simple as possible for patients to use Optune. I am very thankful to them for that. Since I was very convinced of Optune's importance in keeping me alive, I put in all the effort it took to make Optune a regular part of my life. 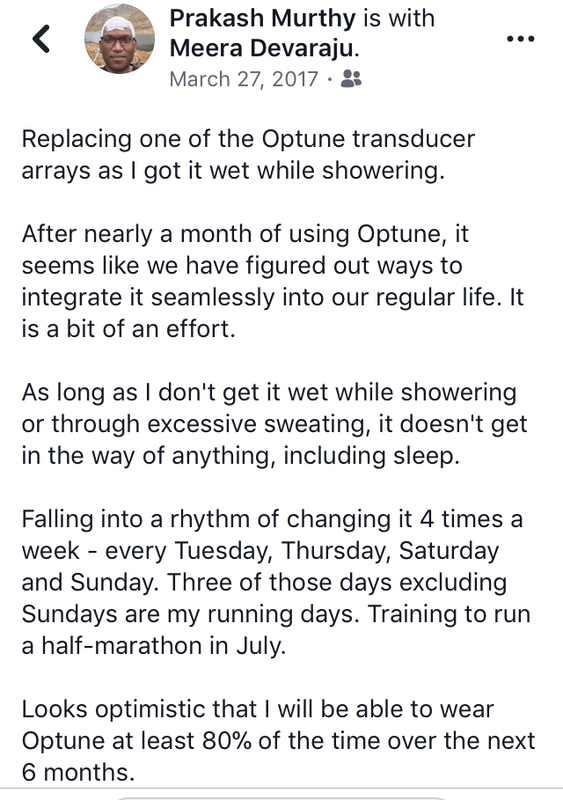 Since I can't do too much physical exercise with Optune on - the resulting sweating will cause the Optune arrays to malfunction, and I would have to change them - I plan my weekly runs ahead of time to coincide with the time when I change my Optune arrays. 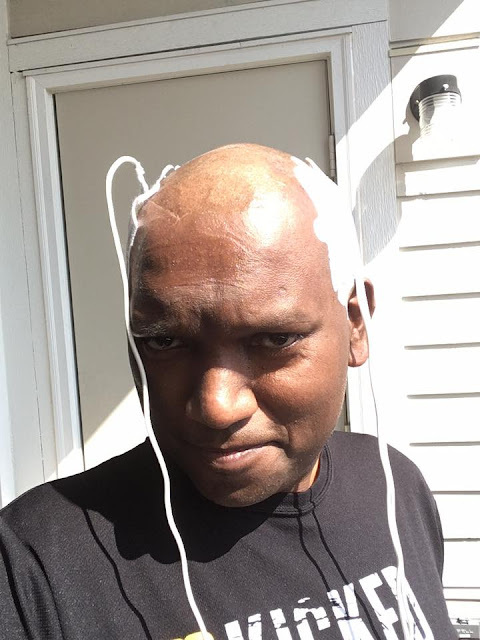 Changing Optune arrays is an involved process - I have to shave my head, and my wife has to help me put the arrays on in the right place. Also, I have to apply anti-itching cream like Cortizone-10 for 45 minutes after taking off the arrays to avoid skin irritation issues. So there is a bit of co-ordination involved in planning the change of Optune arrays. The biggest difficulty living with Optune is the heat during summer days. Heat results in sweating which leads to malfunctioning of the arrays. I avoid going outdoors as much as possible during summer. Also, a fan is a must when I am sleeping during summer. Novocure support team makes it very easy to be on Optune by encouraging changing the arrays as frequently as needed, even every day. 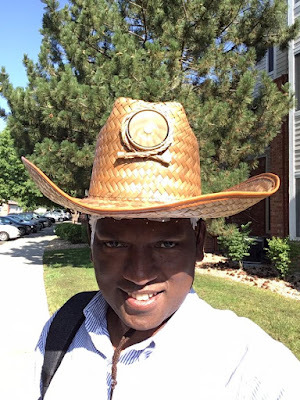 While I was doing daily runs as I was ramping up my training for the Los Angeles Marathon earlier this year, I did take them up on the offer, and was changing arrays every day. The support team is available on phone almost all the time, and are very helpful with any issues I have. Really thankful to them about it! 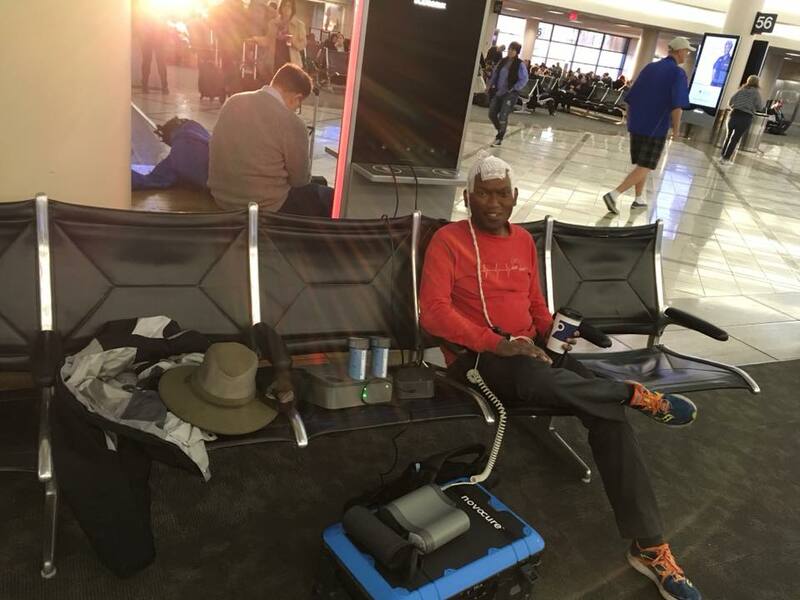 I have been avoiding air travel for a long time as I had assumed it will be very inconvenient to travel with Optune. 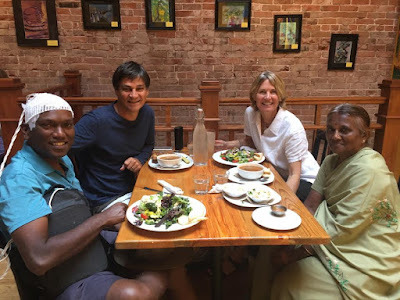 International travel to see my family in India is definitely going to be a lot of hassle, so I am not planning a trip any time soon. It was only recently that I ventured out on a domestic flight trip - from Denver to Los Angeles to run the Los Angeles Marathon. It did turn out to be a bit of a hassle as the Airlines usually limit the number of batteries to be carried on Carry-on luggage to 2. And batteries cannot be put in the check-in luggage. So I had to find places at the Airport to charge the batteries to last the entire journey's length. The battery limit on domestic flights is an issue only if I am traveling by myself. If there is someone else with me, they can carry the other two batteries for me; so I can have access to four fully charged batteries - which last around 15-16 hours - over the long trip. 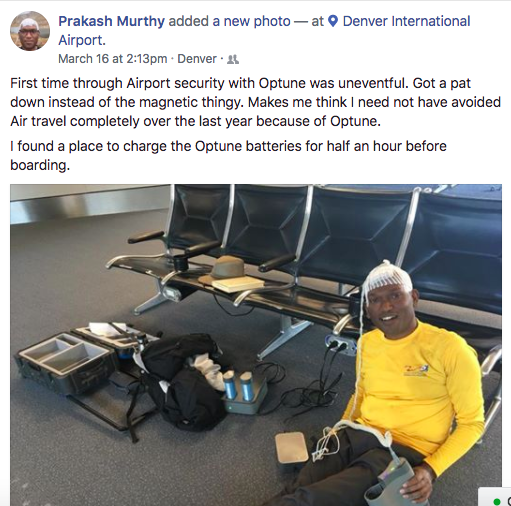 Even while traveling, it is very obvious Novocure folks have optimized Optune paraphernalia for ease and simplicity of usage. Three cheers to them! 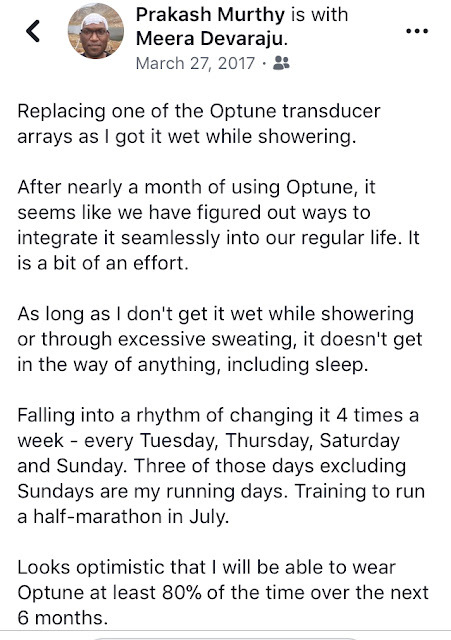 Optune costs $21,000 per month. I am glad my insurance (that I brought through the Obamacare exchange since I am a freelancer) has been paying for most of it throughout. In addition, Novocure has a financial assistance program that provides for me to pay a nominal amount ($200/$300) based on my income in case my insurance does not pay for it. So it looks very likely that I will be able to continue using Optune for as long as I am alive. The Republican Fuckers - in addition to sabotaging Obamacare - have been working on bringing back life-time limits on how much insurances can spend on patients over their lifetime. What that means is: For people like me who need an expensive medication/treatment just to be alive, the insurance companies can - after some time - say: "Hey, you have become too expensive for us to keep alive. Please jump off the nearest skyscraper and end your life." 😡 If it were possible, I would hang every last republican - Conman Dotard, the senators, the representatives, the party office holders, the voters to the very last one, every one of them - till they choke to their deaths. Even that will be being very kind to those heartless bastards. While I like being in the US, there is a small possibility that I give up on living in the US and move back to India - on account of insane gun laws, inhumane healthcare laws, expensive costs of living, etc. - and in that case, it will not be possible for me to continue with Optune. 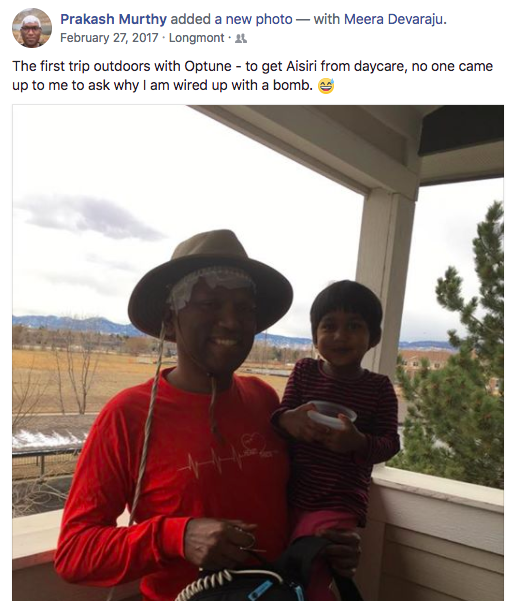 Optune is not offered in India. Even if it is offered in India, the hot weather would make it impossible to sustain over more than a few days/weeks.